Doses of Narcan have proven to be effective in reversing overdoses, but doctors say follow-up medication is needed. One in 10 Massachusetts residents who were revived from an overdose by a fast-acting antidote went on to die within a year, according to research providing stark evidence that merely reversing overdoses will not end the opioid crisis. The study, presented Monday at a medical conference, tracked what happened to thousands of people who received the overdose rescue drug naloxone, commonly known by the brand name Narcan. Nearly all were successfully revived, but a high percentage later died, most likely because their underlying substance-use disorder went untreated, said Dr. Scott G. Weiner, the study’s lead author and an emergency medicine physician at Brigham and Women’s Hospital. 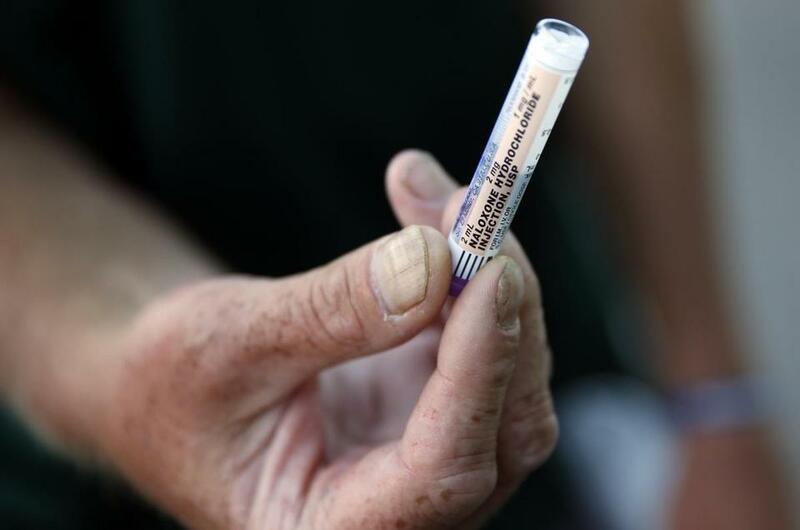 In Massachusetts, state and local health officials have worked to make naloxone widely available, training thousands of laypeople in its use and getting the drug into the hands of first responders around the state. But Weiner, who directs the Brigham Comprehensive Opioid Response and Education Program, said his research shows that “it’s not going to work if we just give naloxone. . . . We need to get them to the next step.” Hospitals should provide medications to treat addictions and immediate links to ongoing care in the community, but few do, he said. Dr. Kevin P. Hill, director of the Division of Addiction Psychiatry at Beth Israel Deaconess Medical Center, who was not involved with the study, called the findings important but not surprising. Weiner presented a summary of his study, which has not been published in a medical journal, at the annual conference of the American College of Emergency Physicians in Washington, D.C.
To conduct the study, Weiner and colleagues delved into a trove of data collected by the Massachusetts Department of Health, which enabled them to connect ambulance, hospital, and death records. They examined what became of 12,192 people who were administered naloxone by emergency medical services in the state between July 1, 2013, and Dec. 31, 2015. Naloxone initially saved most lives; only 6.5 percent died the day they received the medication. But among those who survived the first day, 9.9 percent died within a year. Their median age was 54. Among those who died, nearly 40 percent did so outside of the hospital and more than half passed away in the first month. “This study highlights the grim reality that individuals who survive a non-fatal overdose have a shockingly high mortality rate at one year,” Dr. Sarah Wakeman, medical director of the Substance Use Disorder Initiative at Massachusetts General Hospital, wrote in an e-mail. Wakeman, who was not involved with the study, said that other data from the state show that people who started taking the addiction treatments methadone or buprenorphine after surviving an overdose were half as likely to die as those who did not receive the medications. But only 5 percent of overdose survivors receive those medications, which quiet the cravings for opioids and can pave the way to long-term recovery. At Mass. General, Wakeman said, people who come to the emergency department after an overdose are walked over to the hospital’s Bridge Clinic, where they receive a prescription for buprenorphine, commonly known by the trade name Suboxone. Both the Brigham and Beth Israel are working to make buprenorphine readily available to emergency room patients but face challenges in educating emergency room clinicians and making connections to treatment programs in the community. A sweeping state law passed last year to address the opioid crisis included a provision requiring hospitals to assess patients who come to the emergency room after an overdose and help connect them to a program. But a Globe survey of hospitals in July found that most patients declined even to be assessed. Weiner said the law has been ineffective because hospitals rely on social workers instead of recovery coaches, who have firsthand experience with addiction and stay with patients through the often hours-long process of finding a treatment spot. Some patients are merely handed a list of numbers to call. At the annual conference of the American College of Emergency Physicians, Brigham researchers also presented a separate naloxone-related study. Dr. Scott A. Goldberg, an emergency medicine physician at the Brigham, and colleagues found that untrained bystanders are willing and able to administer naloxone to strangers. In a daylong experiment in Cambridge’s Central Square, researchers asked passersby to participate in a mock overdose rescue on a mannequin. Of the 50 who completed the experiment, only one failed to properly administer the drug by squirting it in the mannequin’s nostril. That person held the device upside down. “We were really surprised that almost all were able to do this,” Goldberg said. After additional study, Goldberg hopes that lock boxes containing naloxone will be routinely placed in public places where overdoses frequently occur.